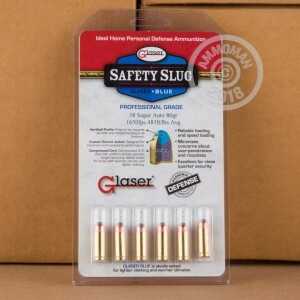 Developed in 1975 specifically for air marshals, Glaser Safety Slug ammo is crafted in such a way as to not over penetrate and not ricochet. These are perfect round for people who are concerned with bullet pass though. 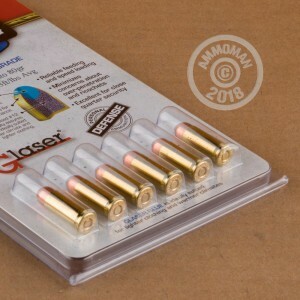 In 2002, the esteemed American company Corbon bought Glaser and now manufactures the ammo in their Sturgis, South Dakota facility. The 38 Super is a fantastic round, giving more power to the 38 ACP. With this high velocity round, you have just what you need for self defense applications. These 80 grain safety slugs dissipate all of their energy within 5"-7" of penetration. This results in a massive amount of energy transfer leading to great stopping power.